Hmmn. Interesting... Just tried clipping a random item from Ebay in the various options you've obviously tried. A bookmark actually gives you a link to the page and a picture (on the few examples I used) of the actual item in Snippet view. Your use case seems a little narrow for Evernote to spend development time and cash specialising the clipper (in multiple browsers) for this activity - but lets see how many others support your suggestion. If you can handle the bookmark layout until more happens on this, it may be a viable work-around. If not, maybe one of the other (many) page-clipper browser extensions may help? I use Nimbus Screenshot when Clipper doesn't get the content I need. Pro and con - you'll see exactly what images are present, and the screenshot image content will be OCR'd... but other links on the page won't be clickable. I'm not the only one who would benefit from this - that's why I bring this up. I want Evernote to be the best and there are many researchers like me who could use this. I think Web clipper also has a specialized clipper category for Youtube videos. So my request is not too far out there. I hope. If anyone has a workaround I would appreciate it. I have tried deleting images on a page to get the right image to be the thumbnail but that's a pain. Especially when you may clip 100 pages a week. I will look into Nimbus, thanks! Also, I need the whole eBay page because it has a lot of information about the photo for sale that a screenshot wouldn't get. Is this another request for selecting the thumbnail in snippet view? OK, I see now that saving as bookmark in Webclipper lets you see the product as a thumbnail in note list. Great! Only problem is eBay does not save listings for very long so the book mark would be useless to retrieve more information about the photograph. 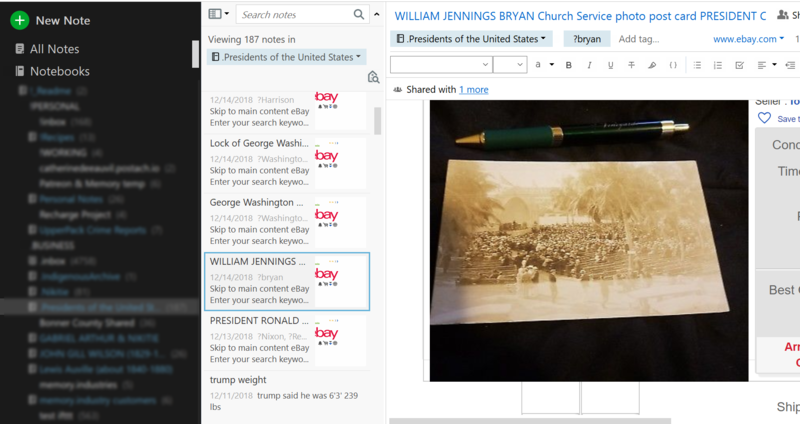 I did find a workaround that is saving the clip in full page mode and then saving in bookmark mode and then going in to Evernote desktop version and merging the 2 notes - this saves the photo as a thumbnail. But so many steps. It would be so much easier if I could just save the page and have the largest image be the thumbnail. @DTLow What do you mean by snippet view?